« MASTODON – “DIVINATIONS” PICTURE DISC SINGLE IS A METAL MUSIC FIND! This entry was posted on January 20, 2010 at 2:41 am and is filed under 1980's hair metal music, 1980's hard rock, 1980's heavy metal music, 1990's heavy metal bands, 1990's rock bands, 1990's rock music, 1990's hair metal bands, 1990's hard rock albums, 1990's hard rock bands, 1990's heavy metal music, 1990's rock albums, Album Review, cool album covers, hair metal albums, hair metal bands, hair metal music, hard rock album review, hard rock bands, hard rock music, hard rock songs, hard rock vocalists, heavy metal album covers, heavy metal album review, heavy metal albums, heavy metal albums 1990, heavy metal bands, heavy metal bands from england, heavy metal history, heavy metal music, heavy metal music 1990, metal odyssey, Music, old school hair metal bands, old school hard rock, old school heavy metal, old school heavy metal bands, rock and roll, rock music with tags 1980's hard rock music, 1980's hair metal music, 1990's hard rock music, 1990's hair metal bands, 1990's hard rock albums, 1990's hard rock bands, 7 o' clock song, a bit of what you fancy album, Album Review, chris johnstone keyboardist, guy bailey guitarist, guy griffin guitarist, hair metal music, Hard Rock, hard rock album review, hard rock albums 1990, hard rock guitarists, hard rock music, hard rock vocalists, heavy metal music, ian wallace drummer, metal odyssey, Music, music reviews, nigel mogg bass guitarist, rock and roll, rock music, spike vocalist, the london quireboys, the london quireboys 1990. You can follow any responses to this entry through the RSS 2.0 feed. You can leave a response, or trackback from your own site. cool post. 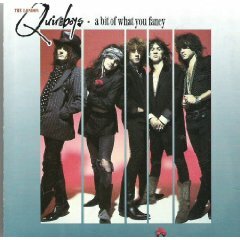 I grew up in the UK and indeed saw the Quireboys play almost the whole album at a small sweaty club (the Birmingham Irish Center) in November 1989! I don’t remember their next follow up album being very good but I think they are still touring and recording. Thats a kick… your seeing this band in a setting similar to what I imagined. You must have a unique perspective on Hard Rock and Metal, growing up in the U.K. back then. I did drift away from The London Quireboys after their first album… thanks for the tips and visiting. Dead on with the fusion of Cinderella and Black Crows!! I was into that album back in the day.